In a time of barely there dressing, where else is there to go? 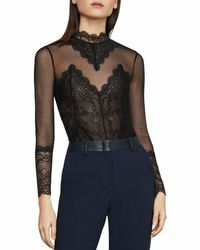 We have the answer - sheer bodysuits. Before you panic, hear us out. Spotted on both Bella Hadid and Kendell Jenner, the sheer bodysuit is the latest way to bear it all. Try a patterned or embellished style if the idea of going completely sheer sends you into a tailspin, or layer a light shirt over the top for a peek-a-boo effect. With style by Forever 21, Balmain and Reformation all trending, it would be rude not to try it.